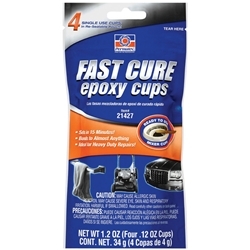 Only 5 LEFT - Convenient premeasured epoxy mixer cups. No mess, no guess, no waste. Ideal for bonding glass, hard plastics, rubber and metal. Bonds in 5-15 minutes. Grey adhesive has excellent chemical resistance. Fills porosities and can be used to build up worn parts.